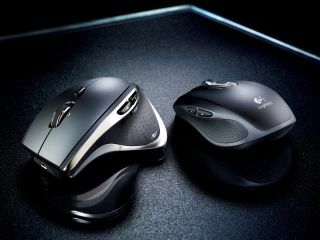 Logitech has brought two new mice to the (glass) table today – the Performance Mouse MX and Anywhere Mouse MX. The biggest coup regarding these computing peripherals is that both mice work on glass that's up to 4mm thick – meaning that you'll finally be able to navigate your mouse on your coffee table, without the hassle of searching the house beforehand for that novelty mouse mat you were given at Christmas. The Performance MX is the daddy of the pair. It's a full-size mouse that is sculpted to fit your hand and has Teflon feet to ensure smooth gliding. The Logitech Anywhere is a more mobile option for those using laptops on the go. It also has Teflon feet and despite its diminutive size is said to be comfortable to use. The reason these mice can glide on glass is because of some nifty technology called Darkfield laser tracking. In short this tech detects microscopic particles and tiny scratches on the glass, rather than tracking the surface itself. Then it uses these imperfections to create a roadmap of the glass surface to track exactly where you have moved the mouse. The Logitech Performance Mouse MX and Anywhere Mouse MX are released now and cost £89.99 and £69.99 respectively. For more information (or just a merry trip around the web), feel free to visit www.logitech.com.